Dog Nail Grinder – What Are Dog Nail Grinders Used For? What Exactly Is a Dog Nail Grinder? A dog nail grinder is an essential tool for pet grooming professionals as well as show dog owners. This tool is used grind, shape, and smooth dog nails. Dog nail grinders are powered rotary tools that are available as corded, rechargeable, or battery-powered devices. Before dog-specific nail grinders were common, pet groomers used rotary tools such as the Dremel. Most professionals continue to use the Dremel type tools over pet specific nail grinders because the Dremel has more power, options, and versatility. Luckily, many any households already have a rotary tool available to use as a dog nail grinder. Dog nail grinders allow you to shave off small amounts of nail at a time. This reduces the chances of affecting your dogs quick. This tool allows you to shape and smooth your dogs nails with precision. By being able to smooth your dogs nail at all angles, a dog nail grinder promotes the receding of your dogs quick. Dog nails with short quicks are healthier and safer for your dog. ​Sometimes, clipping your dogs nails with a clipper can crack the nails - especially if the blade is dull. Grinding your dogs nails results in a smooth nail with less sharp edges. Sharp dog nails are more likely to crack. They also don't feel great on human skin. ​Dog nail grinders can be very loud and intimidating to unaccustomed dogs. If you have never used a dog nail grinder on your pet you will need to introduce the tool slowly. 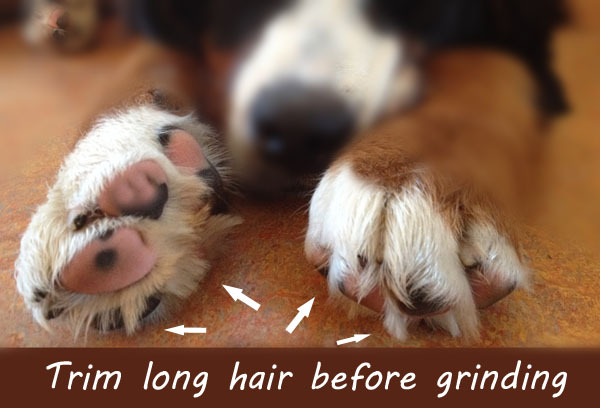 ​Dog nail grinders do produce heat so avoid staying in one position for too long. If your dog has long hair near the paws it could get tangled in shaft of a dog nail grinder. Be sure to trim longer hair before grinding. ​Using a dog nail grinder instead of a nail clipper does take longer. Be sure to choose the correct grinding bit for the job. As the pet product market continues to grow, there are a lot of different dog nail grinders to choose from. For our dogs, we like to use standard rotary tools like the Dremel the best. It has excellent power and we can use it for other tasks aside from dog nail grinding. The only con is that standard non pet-specific Dremels cost more than pet specific dog nail grinders. It is best to look for a dog nail grinder that has the ability to change grinding bits. You can then choose a coarse grit for heavy grinding and then switch to a finer grit for finishing. If you do choose a pet-specific dog nail grinder be sure to choose one that has ample power. Many of the highly commercialized options ​lack sufficient power. 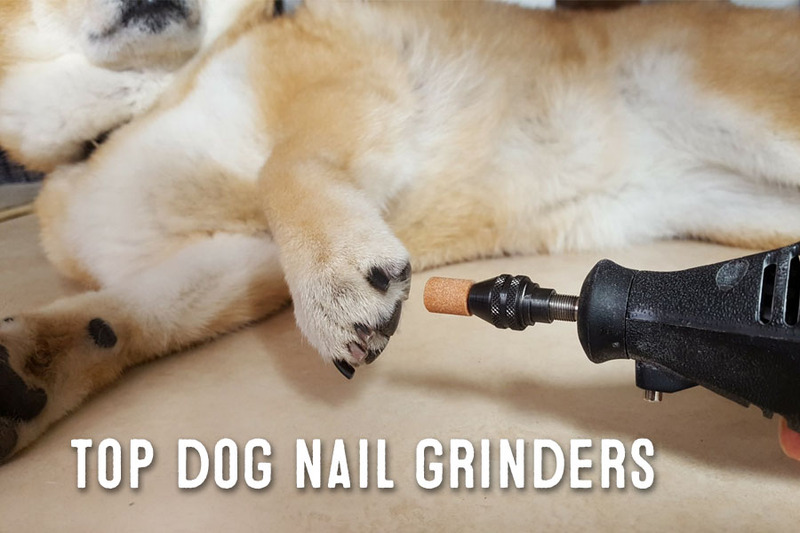 ​The first and most important step for successful nail grinding is to get your dog accustomed to the noise of a dog nail grinder. For some dogs, this will be challenging. 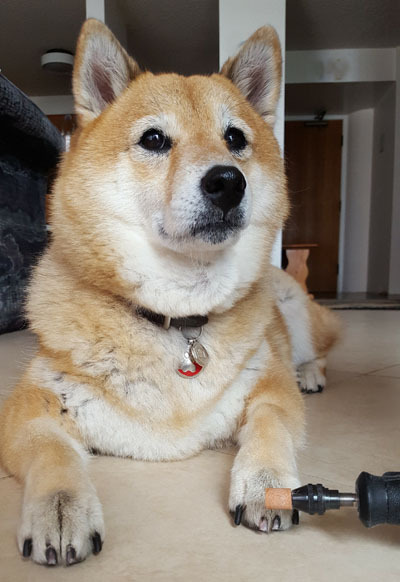 ​The best method to get your dog used to a dog nail grinder is to let your dog associate the noise of the grinder with a reward such as a treat. Calmly show your dog the dog nail grinder and then turn it on to its lowest setting while praising your dog in a happy, yet calm voice. Reward your dog with the treat and try to keep your dog in a calm state while the grinder is still powered on. Repeat the process with more treats and positive reinforcement for as long as your dog can tolerate. Be sure not to force your dog out of its comfort zone. If your dog is nervous or scared, you will have to keep the sessions short. Periodically repeat the sessions over a period of a few days until your dog gets used to the noise. Unfortunately, there will be some dogs that will not be able to tolerate the noise and sensations of a dog nail grinder. In these cases, you can use a dog nail clipper and finish off with a manual nail sander or take your dog to a professional groomer. Hopefully, your dog was cooperative and you completed a successful nail grinding session. If your dog becomes obviously uncomfortable and uncooperative, you may need to cut the session chart. If this happens, try to at least get to all of your dogs nails even if its just for a few seconds each so your dog can get used to the feeling of the tool. Always end the session positively. Out of all of the pet-specific dog nail grinders, this Dremel 7300-PT 4.8V Pet Nail Grooming Too﻿﻿﻿l is one of the few models I would highly recommend. Most dog nail grinders marketed specifically for pet nail trimming simply do not have enough power. If a dog nail grinder lacks sufficient power, the process takes much longer which can make your dog uneasy and unwilling to cooperate. We like the fact that this Dremel dog nail grinder is cordless, light, and easy to maneuver into different positions. The basic kit comes with a few different grinding bits to choose from. The best grits for dog nail grinding are 120 and 240 grit. Start with the 240 grit and finish with the 120 grit. ​The one negative about this grinder is the rechargeable battery life. As the battery gets older, the charge lasts less and less. The power of the unit also weakens when the battery charge starts to drain. Most cordless dog nail grinders also have this issue. This model will work fine on smaller dogs and for owners who are efficient at dog nail grinding. Check the latest price of the ﻿﻿Dremel 7300-PT 4.8V Pet Nail Grooming Tool here. This Dremel 200-1/15 Two-Speed Rotary Tool Kit is the best dog nail grinder for the money. It is a 2-speed corded rotary tool that has a 15,000 and 35,000 rpm setting. The 15,000 rpm setting is more than enough power to grind dog nails. The 35,000 rpm is too strong and loud for dog nail grinding and should be reserved for other tasks. While using this tool, be careful not to accidentally switch it too high because your dog may get startled at the deafening sound. Because this nail grinder is corded, you don't have to worry about battery die out and loss of power. The one negative of this model is that with extra power comes extra noise. All corded dog nail grinders tend to be louder than battery charged ones. Check the latest price of the Dremel 200-1/15 Two-Speed Rotary Tool Kit here. This Dremel 8050-N/18 Micro Rotary Tool Kit is our top choice in dog nail grinders. It takes the best attributes of the other two Dremel models in this review and combines it to make this tool stand apart from all other alternatives. This Dremel 8050 features an 8 volt lithium-ion rechargeable battery that supplies this grinder with ample nail grinding power that the Dremel 7300 Pet model lacked. Unlike Nicad batteries, this lithium-ion battery can be charged at any time without memory effects. The best dog nail grinding feature of this model is that it has 5 speeds starting as low as 5,000 rpm up to 28,000 rpm. 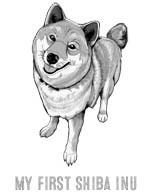 Being able to start the grinder at 5,000 rpm is helpful for nervous dogs and dogs not accustomed to nail grinding. This feature alone can help justify the high price tag of this unit. Despite its power, this Dremel is easy to maneuver and control. A built-in LED light is a handy feature that will to illuminate your dogs nail during grinding. Check the latest price of the Dremel 8050-N/18 Micro﻿﻿ ﻿﻿Rotary Tool Kit with 18 Accessories here.